A couple of months ago, Neil Malek contributed to A Great Day’s Work with the blog post When Working Harder Goes Wrong: Microsoft Word Troubles. 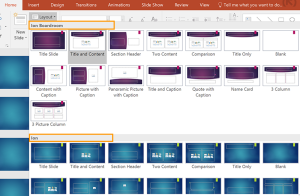 There is almost an identical situation that happens in PowerPoint, and Neil wants to share this with you. You open a slideshow that was built over the last few weeks, months, or years, and for some reason, half the slides have slide numbers, but the other half don’t. And for some reason, a couple of the slides have slightly different font sizes. And the logo isn’t in the corner of the last ten slides…this is weird. 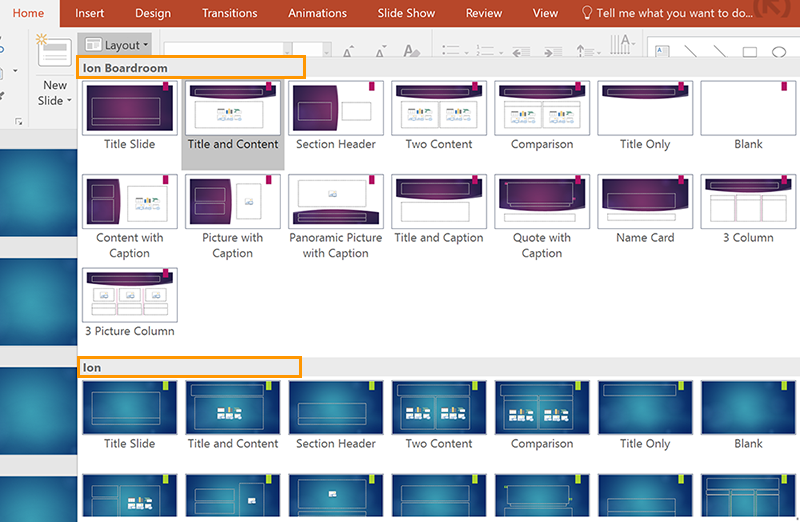 Now, you can roll up your sleeves for hours of frustration, or you can work the way Microsoft intended, with Slide Masters and Slide Layouts. Here’s the source of our problem: every slide in your presentation starts off using a Slide Master to determine the background, fonts, slide numbers, and anything else that isn’t the main content of the slide (text and pictures). 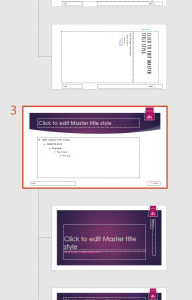 If you or a coworker goes directly to the slide to change its font, instead of the Slide Master, you’re making changes to the individual slide, instead of the template that controls the whole presentation. 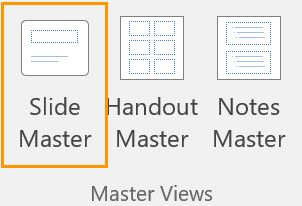 And, heaven forbid, if you combine multiple presentations that use different masters (by copying-and-pasting, for example), and don’t merge them just right, you’ll end up with two slides that look veeeerrrry similar, but aren’t quite the same. If you have two slides that look the same, but use different fonts, or bullets, or something, they have been customized. 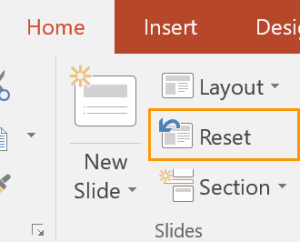 Use the keyboard shortcut [Ctrl] + [A] to select all the slides in your presentation, and choose the button: Home Tab > Slides Group > Reset Button. This will make sure that your slides all use the standard look-and-feel again. Now, you’ll want to check for different Slide Masters. To do this, click the button: Home Tab > Slides Group > Layout Drop-Down Menu. If you see two sections (or three, or more), you’re using two (or more) different slide masters, making different sections of your presentation different from one another. If you’ve followed Step 2, and noticed that there are multiple Slide Masters, click View Tab > Master Views Group > Slide Master Button. Find, in the left-hand panel, a series of slide designs. Look for the prominent, larger slide above a group of smaller ones. The larger slide is a Slide Master, and the smaller ones are the Slide Layouts. If there are multiple Slide Masters, find the one(s) you don’t want, select, and press [Delete]. This will make all the slides in your presentation default to the only Slide Master that’s left. When you’re done, click Slide Master Tab > Close Group > Close Master View Button. 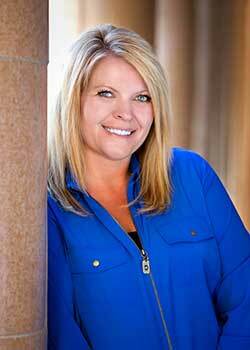 Now that you’ve cleaned up the presentation, do the right thing when you move forward. If you want to change the font size in your presentation, click View Tab > Master Views Group > Slide Master Button, and change the font size on the templated version of the slide. When you’re done, click Slide Master Tab > Close Group > Close Master View Button. And that’s it! 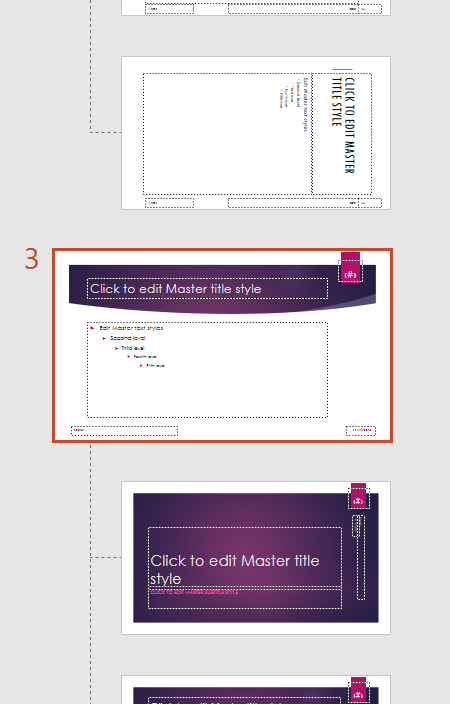 PowerPoint is meant to be formatted using Slide Masters, much like Word is meant to be formatted using Styles. When we use these tools, everything works perfectly. When we don’t…we end up working very, very hard. Connect with Neil: Neil Malek runs Knack Training, a training company that specializes in Microsoft, Adobe, and Google software. 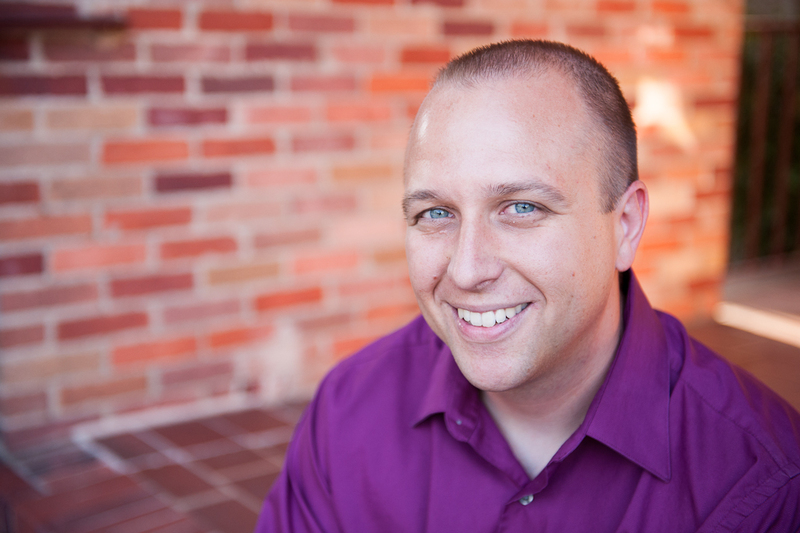 Subscribers to his newsletter email list have access to 12 free webinars in 2016!